Insufficiency fractures are a subtype of stress fractures commonly associated with Osteoporosis and Vitamin D deficiency and a high index of suspicion along with good clinical and radiological examination facilitate diagnosis at unusual sites. 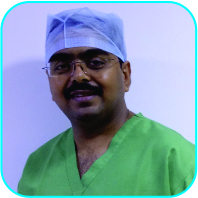 Department of Orthopaedics, Indraprastha Apollo Hospital, Sarita Vihar, New Delhi. India. Mathura Road, New Delhi – 110 076. India. Introduction: Insufficiency fractures (IFs) are a subtype of stress fractures commonly associated with osteoporosis and Vitamin D deficiency. These nontraumatic fractures often occur in the pelvis and spine, but the involvement of other unusual sites is also not very uncommon. Plain radiographs and magnetic resonance imaging scan are the most commonly used imaging modalities for the diagnosis of IF. Case Report:We are presenting a series of five cases of IFs at unusual sites, along with a detailed literature review on this individual. A 50-year-old male patient with chronic kidney disease presented with both femoral neck and right lesser trochanter IF which was managed with cannulated screws. A 53-year-old male patient on steroid presented with sternum IF. A 26-year-old male patient presented with Vitamin D deficiency and accessory navicular IF. A 60-year-old female on bisphosphonate therapy came with bilateral femoral shaft fracture. All these three patients were managed conservatively. Another 62-year-old male patient with rheumatoid arthritis presented with sacrum IF which was managed with cannulated screw fixation. Conclusion: IFs are a subtype of stress fractures commonly associated with osteoporosis and Vitamin D deficiency. A good clinical examination along with proper radiological investigation facilitates early diagnosis of IF in the osteoporotic bone. An early diagnosis helps in deciding the definitive course of treatment and to obtain a good result. An undisplaced fracture can be managed nonoperatively by treating the underlying medical cause, but fractures at the risk of displacement or a displaced fracture may need operative treatment. Keywords: Insufficiency fracture, osteoporosis, Vitamin D deficiency, stress fracture, bone. The terminology of “insufficiency fracture (IF)” is often confused with other mimicking conditions. These are subtypes of stress fractures in bones with decreased mineralization and decreased elasticity, leading to a weakened zone of the bone . A stress fracture occurs due to repeated, rhythmic loading of smaller forces over an extended period . Depending on the properties of bone, the stress fractures are divided into IF, fatigue fractures, and pathological fractures (Table 1) . A “fatigue fracture” occurs in a bone with normal elastic resistance due to an abnormal stress. The term “pathologic fracture” refers to a fracture in bone with an existing pathological condition like a tumor or infection. A healthy bone can withstand considerable stress, but it can fracture due to excessive external force. The long bones of the lower extremity, pelvis, and vertebra are the common sites of IF . The commonly reported sites of IF include pubic rami, proximal femur, and bodies of lumbar and lower thoracic vertebra. The uncommonly reported sites of IFs include medial femoral condyle, talus, sternum, first rib, and sacrum (Table 2). The clinical presentation of IF may vary from a nonspecific low-grade chronic pain to a spontaneous fracture. Till the recent times, it was thought to be a disease of the subservient class, but in the present scenario, it seems to be fast spreading to the common masses and is almost ubiquitous now. Due to its variable presentation, these fractures are often missed. We are presenting a series of five cases of IFs at unusual sites, along with a detailed literature review on this individual (Table 3). A 50-year-old male with chronic kidney disease presented with pain both hips region for past 1 year and inability to walk without support for past 6 months. The pain was severe in intensity and got aggravated on walking. There were no constitutional symptoms, no night pain, or history of any trauma. On investigations, there were deficient levels of serum Vitamin D levels (<3 ng/dl), raised parathyroid hormone (PTH) (1400 mg/dl), and elevated alkaline phosphatase levels (980 units/L). X-ray was suggestive of IF in both femoral necks. Further, computed tomography (CT) scan confirmed the existence of bilateral femoral neck fractures and another fracture in the right lesser trochanter (Fig. 1a and b). He was managed with fixation of both femoral necks with multiple cannulated cancellous screws (Fig. 1c). A 53-year-old male knows the case of steroid-dependent chronic obstructive pulmonary disease (COPD) presented with anterior chest wall pain of 1-month duration. The pain was increased with coughing and sneezing. Examination revealed tenderness over the body of the sternum. A lateral X-ray of the chest wall was suggestive of an IF in the sternum (Fig. 2) and the CT scan confirmed this diagnosis. The patient was managed conservatively. A 62-year-old male known the case of steroid-dependent rheumatoid arthritis presented with pain in the lower back. Local examination revealed tenderness posteriorly over the sacrum; the hip movements were painless. X-ray of pelvis did not show any apparent bony findings but CT scan of the pelvis which revealed IF involving both alae of the sacrum (Fig. 3a and b). The patient was initially managed conservatively but did not respond. 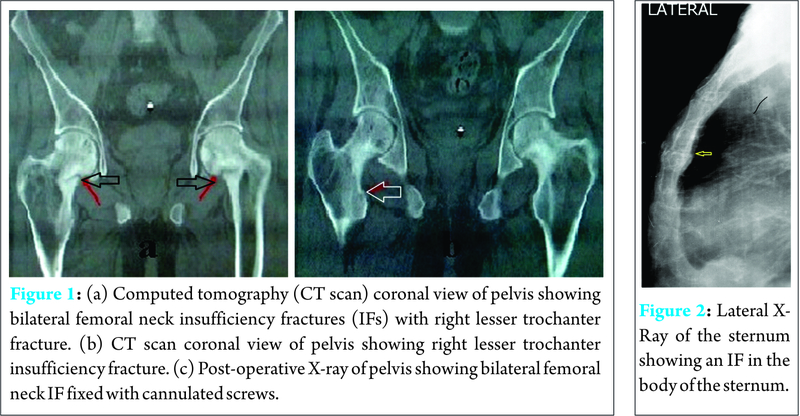 Hence, percutaneous cannulated cancellous screw fixation of both sacral fractures was done (Fig. 3c) with a good outcome. A 26-year-old male presented with pain in the right foot for last 2 weeks after jogging. Examination revealed tenderness over the medial aspect of the foot. X-ray was suggestive of bilateral accessory navicular bones with a suspicion of a fracture on the right side. CT scan of the foot confirmed an IF of the right accessory navicular (Fig. 4). He also had a severe deficiency of Vitamin D. He was managed conservatively in a cast for 6 weeks and Vitamin D supplementation. 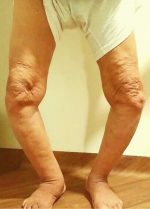 A 60-year-old female with a history of prolonged intake of sodium Alendronate for past 6 years presented with pain over both thighs and difficulty in walking for past 1 month. It was increased during walking and relieved with rest or medication. An X-ray revealed insufficiency lesions involving the left proximal femur and right femoral shaft (Fig. 5). The patient was managed conservatively, by stopping Alendronate and using teriparatide injections (20 mcg daily for 6 months). Senile and post-menopausal osteoporosis is the most common predisposing factor for IF. However, there may be various other risk factors (Table 4) involved. Vitamin D deficiency due to liver or kidney disease, insufficient dietary intake, reduced exposure to sunlight or a defect at the level of receptors of Vitamin D, secondary or tertiary hyperparathyroidism is reported underlying causes of IF. The rise in PTH can occur as a secondary response to hypocalcemia or hypophosphatemia , resulting in altered mineral homeostasis in the bones and rendering it weak and liable to fracture with a nominal force. A typical patient presents with continuous pain at multiple sites (hip, pelvic region, and other weight-bearing areas being common), sedentary lifestyle, morbid obesity (body mass index > 30), and obvious stress. Risk factors for osteoporosis are old age, menopause, chronic kidney failure, osteomalacia, and high-dose corticosteroid therapy . Although the IF is commonly seen in the pubic rami, proximal femur, scapular neck, and vertebrae, these may occur at other uncommon sites also. Our five reported cases at such unusual sites emphasize that a high index of suspicion and the clinical awareness about the entity of IF must be present in the mind of treating doctors, to reach to an early diagnosis. Femoral neck being a zone of excess force transmission, IFs of the femoral neck are commonly reported with a variety of underlying etiology, but IF of lesser trochanter is not described in the literature. Huang et al. in 2012 reported a series of 17 post-menopausal sternal fractures; all the cases were associated with osteoporosis and risk factors such as COPD, systemic lupus erythematosus, and steroid intake. We believe that our case no 3 had osteoporotic bone due to chronic steroid intake and repeated stress due to a chronic cough precipitated the fracture. Cases of sacral IFs are reported to present as low back pain in pregnancy and in elderly. These have been noted to mimic other conditions such as spinal stenosis, sacroiliac joint infection, and metastatic bone disease. Lawson et al. in 1984 reviewed 10 cases of painful accessory navicular with increased activity on 99mTc MDP imaging and histological features suggestive of fractures after excision. 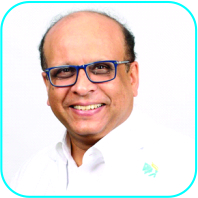 Due to the advent of better imaging techniques, such cases can be now diagnosed early and better managed with less morbidity. Long-term bisphosphonate therapy has been linked with definite risk of the sub-trochanteric femoral shaft and atypical femoral fractures . Typically, IF presents bilaterally in a symmetric pattern but can also present as unilateral or asymmetric lesions. In severely osteoporotic cases, these fractures can also occur spontaneously. These patients with IF should be subjected to blood investigations to check for PTH and serum Vitamin D levels (suspecting insufficiency disease). Besides erythrocyte sedimentation rate (ESR), liver functions, and renal functions should also be done to ascertain the causes (suspecting multiple myeloma or malignancy). A skeletal survey using digital radiographs involving the painful sites should also be undertaken. Conservative measures such as pain control, nonweight-bearing followed by gradual physical rehabilitation form the mainstay of treatment of an IF. Healing of these fractures usually occurs within 4 months of medical therapy. If serum Vitamin D levels are low or raised PTH levels alone is found, Vitamin D supplementation, avoidance of stressful activity, lifestyle modification, and treatment of the cause should suffice to increase the Vitamin D levels to its normal value subsequently normalizing PTH levels. On the other hand, if low Vitamin D levels and raised PTH levels are coupled with raised ESR, serum alkaline phosphatase, and suspicion of fractures on radiographs, these calls for more comprehensive investigative tools like a positive emission tomography (PET) scan to look for possible sites of primary malignancy or other sites of involvement. Serum protein electrophoresis is recommended when multiple myeloma is suspected. A magnetic resonance imaging (MRI) also may be necessary to rule out malignancy and extent of soft tissue involvement. MRI is indicated in nonambulatory patients without any findings on X-rays. Although costly, it has a significant role in the diagnosis of IF as the delay in diagnosis of fractures of weight-bearing areas can lead to immobility and its associated complications such as deep vein thrombosis, loss of muscle strength, respiratory infections, decreased cardiac output, and even depression. Late diagnosis may also result in more invasive therapy. For example, a femoral neck IF if diagnosed early (before displacement) can be fixed surgically rather than requiring a total hip arthroplasty. Characteristic bone marrow edema is noted in MRI, and fracture lines are frequently seen for IF and stress fractures. Once the diagnosis and the extent of skeletal involvement are confirmed, one can logically proceed with treatment. Lifestyle changes such as avoidance of trauma and other stressful activities, dietary modifications to include Vitamin D rich diet and diet fortified with calcium. Immobilization may be required for 6-12 weeks during which period the patient is closely monitored for aggravation of symptoms and new complaints. If the bone healing is progressing at an optimal rate and the hormone levels are normalizing, then a comprehensive management strategy can be continued. Otherwise, a prophylactic fixation and further evaluation may be mandatory to look for the further causes of hormonal insufficiency. A high index of suspicion for IF coupled with imaging modalities can lead to the diagnosis. The sensitivity of radiographs for diagnosing IF varies with the site. MRI is an established modality for visualization of bone marrow abnormalities associated with IF and can also help in differentiating between IF and pathological fractures due to tumor infiltration. Some imaging techniques can also be useful in the diagnosis of IF. Thin-section multidetector CT allows direct visualization of bone discontinuity. Bone scintigraphy although sensitive for the detection of IFs but is less specific. PET-CT with hybrid scanners is an upcoming modality in the diagnosis of such lesions. Bone densitometry is useful in identifying the high-risk cases of possible IF. It is imminent to note that IF governs an area of widespread interest in orthopedics recently. These fractures occur as a result of normal force to abnormal bone. Bone remodeling capacity reduces with advancing age and reduction in hormone levels hence rendering the internal architecture of the bone weak and liable to fractures. In diseases like osteoporosis, the loss of bone strength is out of proportion to the loss of bone mass as the structural integrity between the bone plates is altered. The normal compact bone architecture is converted into immature callus rendering the bone weak and liable to fractures with minimal force . Vitamin D, PTH, and minerals such as calcium, phosphorus, and fluoride play a major role in the bone remodeling process. It is only a perfect harmony between the absorption, storage, release, and excretion of these keystone minerals in the body under the influence of regulating hormones such as Vitamin D and PTH, which a healthy bone health can be maintained. These hormones are in turn controlled by internal organs such as liver and kidneys and external factors such as intake and interactions with other molecules. Weight-bearing bones of the body such as hip, pelvic bone, spine, and long bones are areas of high stress , and any pathology in these regions in a low-stress setting should strongly arouse suspicion of metabolic insufficiency. Neurological impairment is rarely detectable in these fractures. Many of these IF go unnoticed due to lack of awareness and high index of suspicion by the treating doctors. Due to the pre-existing trabecular rarefication and delay in endosteal callus formation in osteoporotic bones, radiographic signs of fracture such as sclerosis owing to trabecular compression and callus formation are rarely seen in IFs . An IF in the axial skeleton may easily be easily missed as it may be obscured by the bowel gas shadows, whereas in overall assessment these fractures are only an incidental finding in a radiograph. A proper knowledge of their etiology, diagnosis through channelized sequential investigations, and methods of treatment has been long overlooked and needs to be integrated into our long-term strategy to deal with these cases. 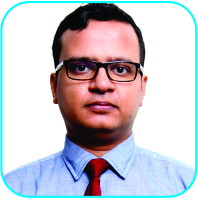 A good clinical examination to locate tenderness followed by MRI scanning of relevant area facilitates early diagnosis of IF in osteoporotic bone. An early diagnosis of an IF helps in deciding the definitive course of treatment and to obtain a good result. Ifs are a subtype of stress fractures commonly associated with osteoporosis and Vitamin D deficiency. A good clinical examination and radiological investigation facilitate diagnosis of IF in the osteoporotic bone. 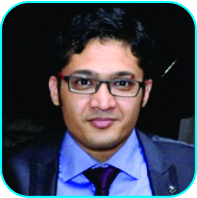 An early diagnosis helps in deciding the definitive course of treatment and to obtain a good result. Ifs are a subtype of stress fractures commonly associated with osteoporosis and Vitamin D deficiency and a good clinical examination along with proper radiological investigation facilitates early diagnosis of insufficiency fracture at unusual sites. 1. Tsiridis E, Upadhyay N, Giannoudis PV. Sacral insufficiency fractures: Current concepts of management. Osteoporos Int 2006;17(12):1716-1725. 2. Pentecost RL, Murray RA, Brindley HH. 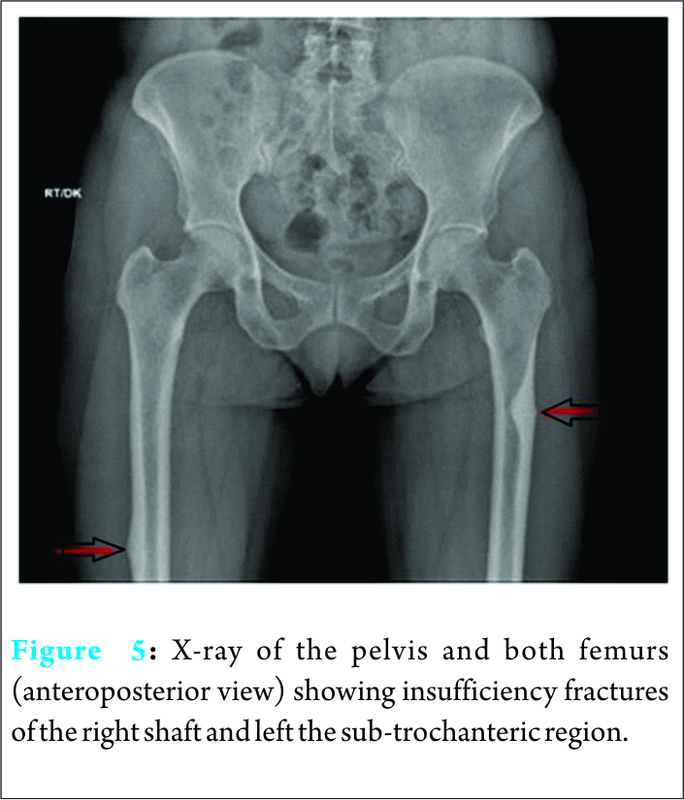 Fatigue, insufficiency, and pathologic fractures. JAMA 1964;187:1001-1004. 3. McBryde AM Jr. Stress fractures in athletes. J Sports Med 1975;3(5):212-217. 4. Min JK, Joo HJ, Kim TH, Yoo JH, Sung MS, Cho CS, et al. A case of sternal insufficiency fracture. Korean J Intern Med 1999;14(2):94-97. 5. Ishimaru D, Sumi H. A Case of an insufficiency fracture of the medial proximal tibia secondary to osteomalacia associated with long-term saccharated ferric oxide administration. 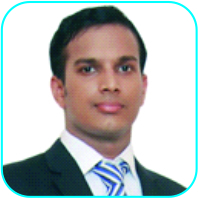 Case Rep Orthop 2017;2017:1675654. 6. Hameed K, Packe GE, Legge JS, Friend JA. Spontaneous sternal fractures in four patients with chronic airflow obstruction taking corticosteroids. Thorax 1993;48(11):1183-1184. 7. Gedmintas L, Solomon DH, Kim SC. Bisphosphonates and risk of subtrochanteric, femoral shaft, and atypical femur fracture: A systematic review and meta-analysis. J Bone Miner Res 2013;28(8):1729-1737. 8. Lane JM, Vigorita VJ. Osteoporosis. J Bone Joint Surg Am 1983;65(2):274-278. 9. Sims SH. Subtrochanteric femur fractures. Orthop Clin North Am 2002;33(1):113-12. 10. Lourie H. Spontaneous osteoporotic fracture of the sacrum. An unrecognized syndrome of the elderly. JAMA 1982;248(6):715-717.